Are you tired of carrying your Pentacon Six around in your hands because you can't put a neckstrap on it? 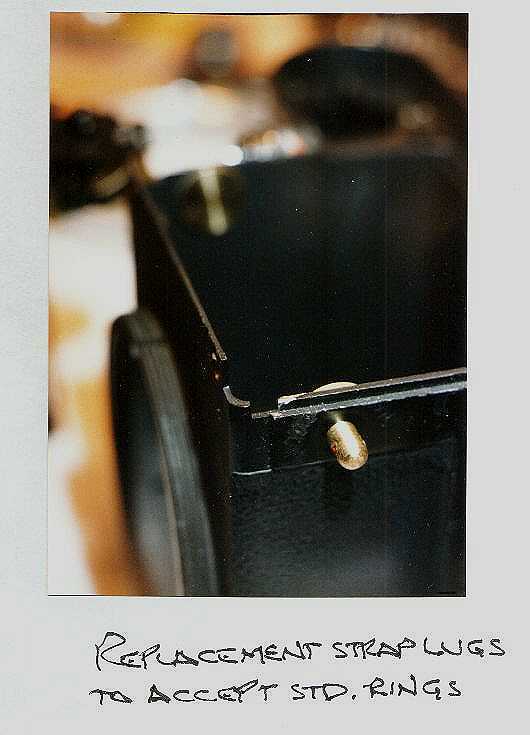 Here are the basic instructions for making a pair of "normal" strap lugs for it, and opening the camera up so you can install them. In the process, you'll also have removed the shutter module from the camera so you can do such things as adjust the shutter speeds and replace a pinholed curtain; but I have to offer a warning here: the Pentacon Six does not reward a casual approach to shutter speed adjustment, so if you're going to take that on, allow plenty of time and be methodical with it. I'm not going to post the adjustment procedure here and encourage you to get into trouble; if you would like those sketches, please email me for them. I apologize for the ugly sketches; I'll try to get them cleaned up sometime. Here are the twins: The Pentacon Six can accept a "regular" neckstrap, though it's hard to see the black strap lugs in the photo. 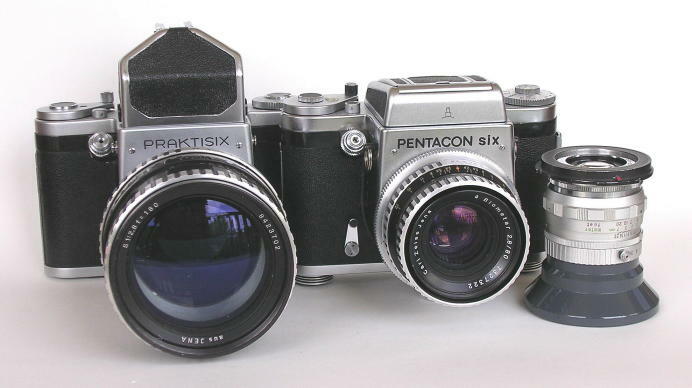 The Praktisix is shown with the World's Cheapest 180/2.8 Sonnar; next to the Pentacon is a 52mm f/3.5 Kaligar wide angle lens using the adapter described at the link below.